Drug-eluting stents (DES) have revolutionised the treatment of acute coronary syndrome, resulting in improvement in mortality and morbidity. However, there have been safety concerns, mainly involving a small, but long-term, risk of stent thrombosis (ST) and in-stent restenosis (ISR). Stent fracture (SF) is a lesser-known complication that can predispose to both ST and ISR and for which there is no general consensus for treatment. We present an interesting case and a new approach to treating this complex problem. A 44-year-old smoker with a history of hypertension, high cholesterol and positive family history presented with inferior wall ST-elevation myocardial infarction (STEMI). Angiography revealed the culprit was an occluded right coronary artery (RCA). A drug-eluting stent (Taxus element) 2.75 by 24 mm was deployed and the patient discharged with follow-up on dual antiplatelet therapy (DAPT) (aspirin and clopidogrel). Three years later he was re-admitted with another inferior STEMI. Angiography revealed occlusion of the previously stented segment. Aspiration thrombectomy followed by intravascular ultrasound imaging (as optical coherence tomography [OCT] was being serviced) clearly demonstrated gross mal-apposition of the stent: the RCA diameter was 4.5 mm and the stent 3 mm (figure 1). The stent was dilated with 4.5 mm balloon only, with a good result. The patient was discharged on aspirin and ticagrelor. The RCA had to be treated, so the question is how best to treat the fractured stent with protruding stent struts? Our case was complex, as stenting in mal-apposed stent struts would result in a double layer of metal, leading to an increased risk of thrombogenicity and in-stent restenosis (ISR) long term. Coronary artery bypass grafting (CABG) could be considered, but would be the last treatment choice in the setting of single-vessel disease, and would not be appropriate in the acute setting. We chose to perform drug-coated balloon (DCB) angioplasty to reduce the potential risk of further stent thrombosis (ST) or ISR, although we accept there is little current evidence for its use in such cases. Following aspiration thrombectomy, and imaging and vessel measurement with OCT, a decision was made to treat the RCA with a DCB 3 by 26 mm, and a good result was obtained (figure 4). The patient made an uneventful recovery and was discharged on DAPT (aspirin and prasugrel in view of ST). Six months post-procedure, the patient was readmitted electively for repeat angiogram and OCT, which showed complete coverage of the stent struts with evidence of mild ISR only. SF was first reported in 2002 after a bare metal stent (BMS) implantation in a venous bypass graft,2 and in DES two years later.3 The incidence of SF is reported to be between 1% and 8%,4 and the presentation may range from asymptomatic to angina, myocardial infarction and sudden death. A number of predicting factors have been described in the literature, including the type of stent, handling, technique, length, balloon over-expansion and the type of vessel being stented.4 Among the stents, Cypher sirolimus stents have frequently been associated with SF, possibly because of their rigid closed-cell structure and, secondly, because of their radio-opaque nature, hence, making them more visible. An association with aneurysm formation has also been reported, presumably caused by arterial or intimal tears and inflammation caused by polymer. 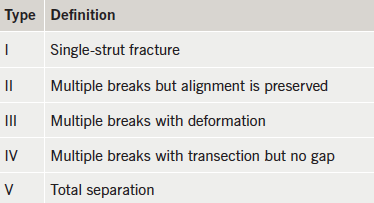 In addition, there are reports of increased ST and ISR related to interruption of drug delivery as a result of strut fracture, leading to neo-intimal overgrowth and stenosis. As far as treatment options are concerned, there is no general consensus, making it a complex complication to treat. The management of SF depends on the type, presentation, symptoms and the presence of factors predicting recurrence (i.e. calcified lesions, tortuous vessel, technically difficult angioplasty). The treatment options vary from stenting, ballooning and, in some cases, CABG. Long-term DAPT has also been suggested. In our case, the patient had multiple admissions, presenting first with inferior STEMI, followed by re-occlusion due to very late mal-apposition, most probably caused by a combination of positive remodelling of the vessel and under-sized stent, and, finally, a further re-occlusion due to SF caused by over expansion of the stent with a large balloon leading to ISR and ST. Successful treatment of SF in the context of ST with a DCB, to our knowledge, has not been reported before. In conclusion, DES is the mainstay treatment of acute coronary syndrome. Despite the growing evidence base for acute coronary syndrome treatment, management of SF remains challenging and poorly researched. The concept of using DCB for treating SF is both novel and unique, and it comes with the advantage of a low-risk of thrombogenicity, shorter duration of DAPT and is also reported to be associated with positive remodelling of the vessel. With the help of this case report we present a new approach to treating the complex problem of stent fractures. SCE has received an unrestricted research grant from, and consulted for, B. Braun. UR and TJG: none declared.